Dave Buchanan believes Saturday’s 1-1 draw at Sky Bet League One leaders Scunthorpe United ‘sends out a message’ to every player in the Cobblers squad that they deserve to be where they are. 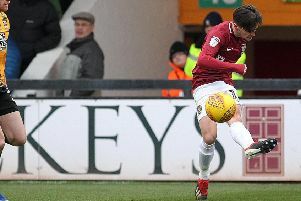 The draw at Glanford Park sees the Cobblers sit in sixth place in the league one table with more than a quarter of the season played, and on-field skipper Buchanan says he and his team-mates have to take ‘self belief’ from that. Town looked to be up against it against the table-topping Iron when Matt Taylor was sent-off on the hour, with the home side already leading thanks to Josh Morris’s stunning first-half free-kick. But Rob Page’s men refused to be beaten and deservedly scored an equaliser through Jak McCourt to secure a point, much to the delight of Buchanan. “I think the result sends out a message to our own dressing room,” said the left-back, who has yet to miss a Town game since signing for the club in the summer of 2015. “We’re not worried about anyone else in the league, we’ve got to look after ourselves and we should take a lot of belief from this game. And he added: “It’s a fantastic result and shows the character that’s in our dressing room. “We’ve spoken about it for months at this club and we just don’t know when we’re beaten. “We knew it’d be a difficult game and I thought they started the game well but I thought we had the best two chances in the first-half with Alex Revell and JJ Hooper. “But everything Josh Morris hits seems to go in at the minute, but we knew at half-time we had played well enough to be level. On his team’s reaction to the controversial dismissal of Taylor, Buchanan said: “It shows how tight-knit we are and that we don’t know when we’re beaten. “Jak McCourt got his first league goal and for a 21-year-old player sitting in front of the back four he showed maturity beyond his years, especially in the second-half. “He picked up second balls, he passed it well and he got us back into the game.